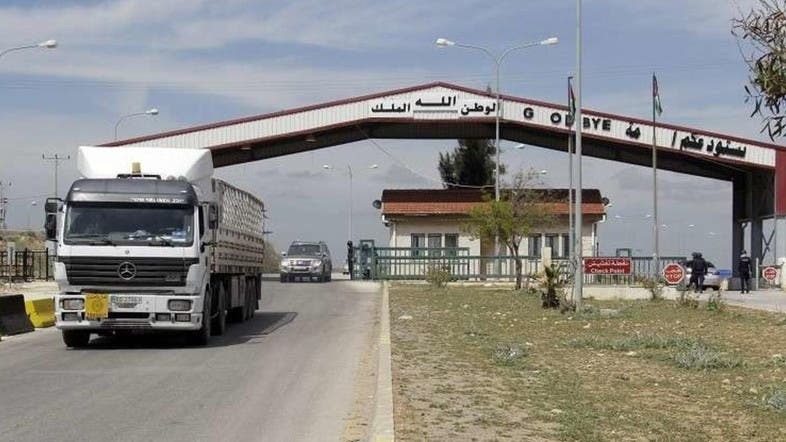 The Jordanian government announced on Wednesday the opening of three border crossings with Syria to hasten operations of delivering humanitarian aid to displaced Syrians from Southern Syria. “The government decided to open the three border crossings on Wednesday in order to facilitate the transit of humanitarian aid to displaced Syrians,” the Ammon news agency cited Jordanian government spokeswoman Jumana Ghunaimat as saying. Ghunaimat did not elaborate on which border crossings will be opened, but she said that 36 trucks carrying humanitarian aid crossed in the direction of the Syrian territories. Earlier, the Jordanian army expressed in a statement its concern that ISIS and other radical groups will take advantage of the displacement crisis in the Daraa province south of Syria. In an interview with the al-Hadath news channel, Jordanian army general Awda al-Shudeifat said that Jordan will hold on to its decision not to open its border to let in more displaced Syrians, expressing the country’s concern about the infiltration of terrorists among the refugees. On another development, Jordanian government spokeswoman Ghunaimat revealed that negotiations between Russia and Syrian opposition have resumed with the help of Jordanian mediation.